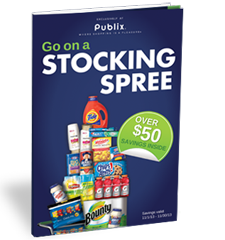 Sign up for Stocking Spree and save at Publix® Super Markets. Enroll once and receive a Stocking Spree Booklet* filled with savings on your family’s favorite brands like Oscar Mayer®, Gatorade®, Bounty®, Pampers®, Kraft®, Tide® and more! You can find all the coupons we post on the Hunt4Freebies Coupons and Deals Page. Yes it is, everything here is 🙂 If you every have any questions please don’t ever hesitate to contact us. Hey I live in AZ and always get this book. You can put in any state and still get this book.